Title: Stuck on Stupid: How to Eliminate 95% of HIPAA Liability while being less than Thirty Percent (30%) Compliant. Description: This webinar focuses on providing the C-Suite and compliance officers a strategy for eliminating a significant portion of HIPAA liability despite the fact that your organization may be less than 30% compliant. All organizations, both large and small, must make strategic decisions as to what to attack first with limited compliance budgets and staff. Description: Many people claim that the amount of paperwork required for HIPAA is voluminous. This webinar will cover a proposed taxonomy that will enable you to organize the visible, demonstrable evidence required to prove compliance at the granularity level of a requirement. Please note that some attendees have experienced difficulty in obtaining their Certificate of Attendance due to the requirement for Adobe Flash Plug-In. If you experience difficulty, please forward the email with the link to dleyva@3lionspublishing.com and your Certificate will be mailed back. Does your staff have sufficient HIPAA training? Determining the amount of adequate training is not an easy question because the answer is highly dependent on the individual and the organization. Individuals often claim that vendor training provides only the problems, but not the solutions. That is a missed opportunity because if you know the problem and don't have an adequate answer, you're likely to be faced with difficulty responding and potentially encounter an Incident, Breach, or unauthorized disclosure of Protected Health Information ("PHI"). In this article, we describe aspects of what may be considered "good training" and what kind of training we make available so that you can compare across vendors. You need answers! In our view, if you do not succeed in establishing compliance literacy in your workforce, you are likely going to have an occasional bad day, not to mention being out of compliance with the HIPAA regulations for training and associated documentation. As expressly stated in HHS' Audit Protocol, policies and procedures that have been adopted and activated by covered entities and business associates to meet selected standards are reviewed to determine an organization's implementation specifications of the Privacy, Security, and Breach Notification Rules. Training, by the way, is one of the Privacy Rule Regulations. If you are audited, one of the things that will be reviewed is your training documentation. Yes, seems this is a small item compared to your Risk Assessment and other Compliance efforts. However, Covered Entities ("CE") and Business Associates ("BA") must train all members of their workforce regarding PHI as it applies and as necessary to perform their jobs. Compliance with Privacy Rule regulation 164.530(b) requires policies and procedures for training and to document which staff member was trained on what topic and when. From a practical standpoint, when it comes to training, it's not enough to have an understanding of the regulations, but also training should provide the ability to evaluate responses to a variety of situations where PHI may be at risk. Training that provides hypothetical risk situations related to HIPAA regulations that prevent incidents or breaches and/or a Quiz regarding knowledge obtained is a component of quality education. But is HIPAA a top priority for a CEO's average day? Probably not, unless there is an Incident or a Breach. The same is likely true for other executives in your organization. Aside from the regulation requirement, this is a VERY good reason why a named Compliance Officer should be in each Covered Entity and Business Associate's organization. A Compliance Officer has the responsibility to ensure that policies and procedures are being followed by the workforce to avoid non-compliance. And yes, the Compliance Officer ensures policies for training and the visible, demonstrable evidence for same. So, how much training is really needed? For the purpose of this article, we will use the HIPAA Training Products contained within our Subscription Plan as training recommendation topics for different categories of workforce members. Again, remember our principal premise is that all workforce members need to become HIPAA literate since you have the 800-pound gorilla of Breach Notification staring you in the face. Why do we recommend specific training for clinicians? Well, I can say as a Registered Nurse, clinicians do not need to understand every aspect of the regulations. What they need to know is how to respond to various threats to PHI or situations where compliance action is required. They need an awareness and a basic understanding of Security, Privacy, and Breach Notification regulations that will enable prevention of risks while managing situations when HIPAA rules are tested. A particular item of importance is knowing WHO to call when a situation arises. The same is true for Business Associates. You might be surprised at the number of times I have randomly asked clinicians the name of their HIPAA Compliance Officer and they did not know. That's a recipe for a bad day! Try this yourself next time you visit your doctor. Ask the receptionist or the nurse, or any other clinician or workforce member you encounter if they know the name of their Compliance Officer. By the way, this is generally true of organizations both large and small, even those that regularly train their employees. The following list of training modules is recommended for other workforce members, including the executive management team. I have been asked if there is a HIPAA LITE for Business Associates, and the answer is No! Business Associates need to be as aware of the regulations as Covered Entities if they are "touching PHI." That said, we also provide specialized training for Business Associates in situations where their needs differ from Covered Entities (see below). In addition to the training above, compliance officers should consider taking the following training classes to obtain their certification. We offer a HIPAA Certified Professional ("HCP") certification after taking an exam that covers material from the training modules listed below. For some, the amount of information may be overwhelming, but just like HIPAA, you bite off a piece of the elephant one at a time. Training for workforce members that are designated as "point persons" for the Patient's Bill of Rights; these are sections 164.520 through 164.528 of the Privacy Rule. Distributing the notice of privacy practices, etc. Training for individuals that handle Privacy Rule requests for authorizations, restrictions, etc. Training for personnel assigned the responsibility of tracking security incidents. Training for information technology personnel that are required to audit information systems containing PHI. Training for personnel that are assigned the responsibility for disposing of PHI. This is not an exhaustive list. The "final" list of training will depend on your operational environment, the size and complexity of your organization, and the resources you have available, etc. One thing is certain, look for training that provides answers, not just a description of the problems. "High Touch" LIVE assistance with Products for Risk Assessment and Remediation. We do NOT charge extra for compliance support like many of our competitors, the cost for your LIVE assistance is included in your Subscription purchase. HIPAA and Expresso Subscription Plan. 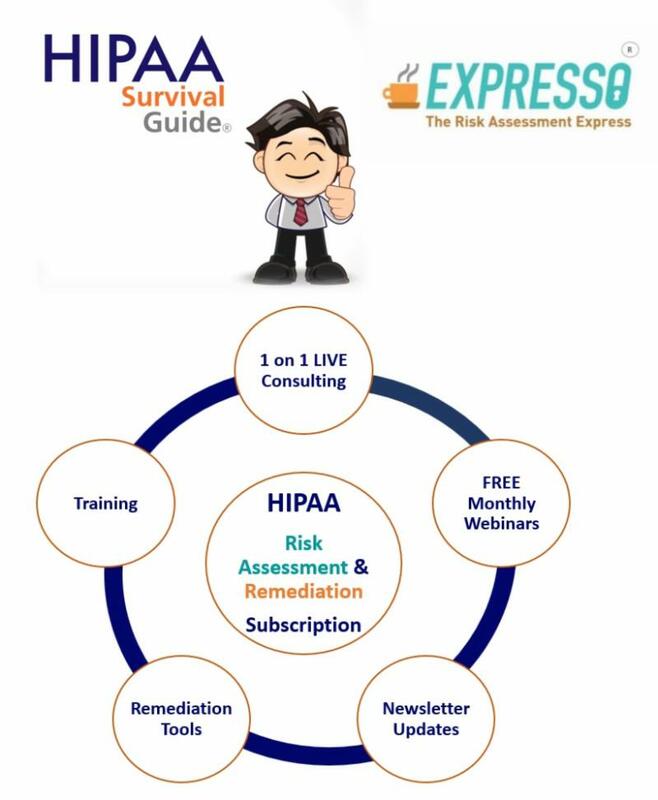 The Subscription Plan includes Expresso®, the Risk Assessment "SaaS" based software, over 30+ compliance and remediation products, and training videos that help Covered Entities and Business Associates understand how to implement the necessary Controls to be in compliance with HIPAA regulations. Our LIVE "High Touch" Assistance helps you "get it done" fast! Our many Training products describe various aspects of the regulations as well as demonstrations of how to use Expresso and associated compliance tools. As part of the Subscription Plan, we also provide certification for clients seeking designation as a HIPAA Certified Professional ("HCP"). A "Crosswalk" between Expresso Risks and Remediation tools provides easy access to model policies, procedures and tracking mechanisms for compliance. FREE Monthly newsletters and webinars provide education on topics of regulatory concern. Missed one? Webinars and articles are posted to the HIPAA Survival Guide Store Website for future reference. So, why are we sharing this information in our Newsletter? Education, Education, Education. Stay tuned not only for Product updates but also for new capabilities and value offered to our elite group of clients. Save time and money with our high quality, bargain Subscription Plan! Or, take advantage of our FREE 15 day trial of Expresso to complete your Risk Assessment! Questions? Please call or write using the contact information below. What is the new LinkedIn GDPR Survival Guide? EXPRESSO RELEASE 2.0 Coming Soon! CLICK HERE TO WATCH THE EXPRESSO® COMPLIANCE EQUATION VIDEO. This short video provides an explanation of how EXPRESSO® uses its Compliance Equation to perform a HIPAA Risk Assessment. In addition, the video describes HIPAA Survival Guide products, education, and tools that you can customize and use in your organization. One of the key HIPAA Survival Guide tools are our Scorecards that not only provide descriptions of HIPAA Implementation Specifications or Controls, but also point you to HIPAA Survival Guide Remediation products, which provide customizable examples of proposed organizational policies, processes, tracking mechanisms and an assortment of compliance tools and education for covered entities and business associates. Scorecards based on specific requirements are the only way to measure the progress of your compliance initiative (i.e. by definition, if you are in compliance with all the requirements of a regulatory regime then you are in compliance).EXPRESSO® and the HIPAA Survival Guide works in tandem to guide your efforts in becoming HIPAA Compliant. Please note that we offer a 15-DAY FREE TEST DRIVE of EXPRESSO®! Why not give it a try? Just click on the link below! To try EXPRESSO®, just click on the above link and fill out your contact information. Our Customer Service Staff will set up your Free 15 Day EXPRESSO® Test Drive and arrange a "Go To Meeting" session to review how you can do your HIPAA Risk Assessment in 3 hours or less. EXPRESSO® is an easy to use Risk Assessment software that allows you to detect risks, threats, security objects, and vulnerabilities to PHI and identify impacts and assign controls at a glance! It allows you to do a Baseline Risk Assessment in 3 Hours or less! Our "Quick Start Guide" gets you off and running to complete your first Risk Assessment. EXPRESSO® comes pre-­populated with all the Risks, Threats, Vulnerabilities and Impacts necessary to a complete a Baseline Risk Assessment. 4) Retain instances of past Risk Assessments for reporting or audit purposes. Chris Saah CEO of TecFac (Technology Facilitators) joined Carlos Leyva and the team for a discussion of the recent the ransomware attack and how to prevent ransomware from penetrating your organization in addition to discussing HHS' methodology implications. Looking for a simplified way to keep up with HIPAA? For a limited time, we are making available our "Showing HHS Visible, Demonstrable, Evidence" webinar when you sign up for our FREE monthly newsletter. Thoughts and comments on the health care industry, privacy, security, technology written by Bob Coffield. Jane Sarasohn-Kahn is a health economist and management consultant that serves clients at the intersection of health and technology. Digital Business Law Group provides legal services covering areas such as copyright, trademark infringement, privacy issues, and more regarding use of the internet. George Van Antwerp's thoughts about healthcare and related topics. THCB - Everything you wanted to know about the Health Care system ... but were afraid to ask. Bloomberg/Businessweek Webcast: Telemedicine Hot or Not? Criteria for EHR "meaningful use"
Practical advice for health care practitioners in light of regulations for the HITECH Act and HIPAA.